Establish a single, secure, cloud-based digital business network delivering always-on availability with industry leading up-times. Available in 3 editions: Essentials, Standard, and Premium. Capitalize on proactive B2B process management to reduce errors and manage your document delivery process times against demanding service level agreements. Designated IBM trusted advisors and technical subject matter experts will provide tailored proactive support to sustain and optimize your global B2B/EDI operations. Worldwide community support ensures personalized assistance is available for you and your trading partners when you need it around the clock. Streamline connections and collaboration with your customers, suppliers, and trading partners to digitize and automate all B2B transactions across your supply chain, with a network of over 400,000 preconnected global trading partners exchanging billions of documents a year. 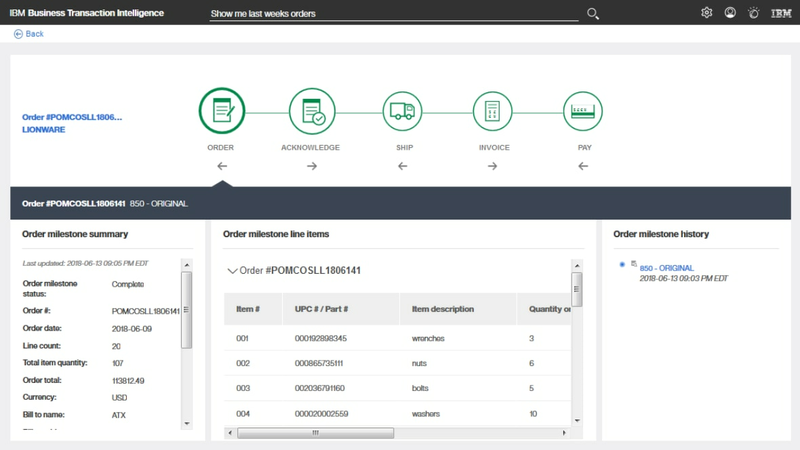 Leverage AI machine learning, pattern detection, and data science expertise to automatically detect and alert your team to anomalies in volume, velocity, and value patterns throughout your supply chain’s B2B documents and transactions. Effortlessly exchange business documents electronically over the internet with small trading partners who currently communicate via fax, email, phone, or paper. Extending EDI capabilities to trading partners regardless of size, technical expertise, or budget restrictions. Business users can quickly pinpoint and assess issues in real-time by leveraging AI to help correlate related documents. Business users can see a holistic view of all relevant transactions in a single dashboard, allowing resolution in minutes not hours. Natural language search and conversation assistant enables business users to ask questions and receive answers using business terminology your team understands, rather than IT technical jargon. Provide IT specialist with in-depth reporting capabilities to monitor and track incoming and outgoing B2B transactions, while alerting you to failures and unexpected events in real-time so you can rapidly identify and resolve issues. Scale to accommodate customers, suppliers, and trading partners with a unique, diverse set of business translations, industry requirements, and government regulations. Supporting technology (X12, EDIFACT, XML, Web Services), industry and government (PEPPOL, e-invoicing, GDPR, RosettaNet) requirements. Seamlessly exchange Pan-European Public Procurement Online (PEPPOL) documents with European public-sector customers, suppliers, and trading partners across the globe, through a single source. Suppliers can feel at ease using the PEPPOL Access Point despite location, without having to work through multiple systems. Transform and optimize your international invoice processes to reduce the risk, cost and complexity associated with tax compliant electronic invoices by automating manual invoice processes, archives and audits in accordance with tax regulations for multiple countries.